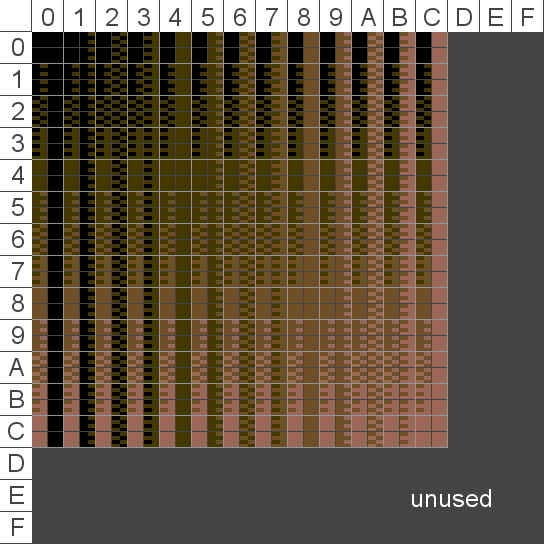 For this effect a standard (that works with new and old CIA) 4×4 routine is used, but instead of bitmap a charset is displayed as half chars, thus we have 16 possible symbols that we can display per cell, the symbols only need to be arranged correctly as a charset so that the lownybble makes the right cell to change and the highnybble makes the left cell of a char to change. As you can see, there are still some chars unused. Ideal to place a logo or gfx in there that can be combined at a granularity of 4×4 with the effect. Also, you might imagine a bunch of other effects that can be done with that kind of mode, just think of the sphere-mapper in Coma Light 13. For flames we need to do three things, they move upward, have a movement in x direction at the base and they fade when ascending. So what we need to do within the whole screen is to move the halfchars from a line to the line above and by that way also decrement the value of the symbols. So if we have a doublecell containing $42 we need to propagate $31 to the halfchar above. Propagation within one char that is resembled by two halfchar lines. For derementing the halfchars one could make use of the sbx command, but problems occur when one of the nybbles underrun. The easiest way to get a decremented value is a lookup table. Whenever the values underrun you can either limit them to $00 and make the fire thus cease at that point or wrap around to make it fill the whole screen repeatedly. Now if we'd do only that, we somewhen would end up in a matrix filled with all zeros or just statically scrolling upwards. Not very fireish indeed. So we need to feed in new high values at the bottom line that can then again be propagated. This we pick a spot per flame and let it move from left to right with some kind of sine or manual table. 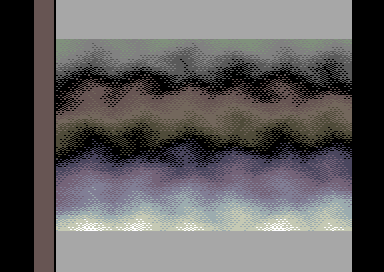 Also we build a descending gradient for each of those spots and in case two gradients of two spots meet, limit them to a value of one of the spots. Now one can enrich things by adding some rastersplits / colorchanges in colram to have more colors displayed on the whole screen. Also a fadein and fadeout and a spritebar to cover the FLI-bug are a nice thing to have. Yet to be enriched with comments.